Auto recycling is a process that saves consumers money, puts cash in their pocket, protects the environment—and (in case all that wasn’t enough) employs local people in your community in meaningful work. Despite all these pluses, many people however drive by their local auto recycling salvage yard every day, and still have no clue what that salvage yard does—and how it contributes to the community. Auto recycling is, at its core, a vehicle dismantling industry, and includes auto recycling yards, salvage yards, wrecking yards and parts recyclers and suppliers. The how-it-works process is relatively simple. Auto recyclers purchase new, aged, damaged, post-accident, non-functioning and end-of-lifecycle cars from the public for cash. They then take those cars and strip them of all the parts that are still in excellent-working condition, clean and/or refurbish them and then resell those parts to the public. The remainder of the car, that can’t be used for parts is then crushed by an auto crusher to reduce the overall size of the steel and metals. The crushed steel is then sold to a steel mill, where it is recycled reused in the production of new vehicles and other steel-based products. The process of recycling cars, for the public, is extremely easy. You simply pull, push, drag or drive the car into the salvage yard, where we give you a haggle-free, fair-market price for the car based on the multiplication of its by-the-book stock weight and the current price of scrap steel. We then complete all the paperwork for you, and you can leave—in minutes—with cash in hand. If you’re in the market for used auto parts—you can give us a call or drop by our location during our business hours to find out if we have the part in stock and available. Should it not currently be in stock we have a network of contacts to source the part for you—which we can generally do within a few days. Call us today with your part need to discuss its availability and cost (or should we say savings). 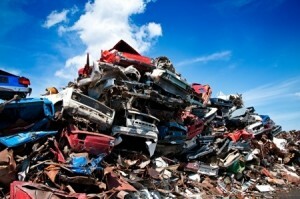 The auto recycling industry in North America has never been more successful than it is today. Currently, there are thousands of auto recyclers just like Woodbecks, spread out across Canada and the United States. Together, we process between 12-15 million cars every single year, and are able to recycle up to 75% of the materials of those cars. If you would like to participate in auto recycling, or take into advantage of affordable used auto parts and you live in Stirling, Belleville, Kingston or Prince Edward County—then your local source in this network of auto recyclers is Woodbecks.